The mid-90s saw a great explosion in the craft beer scene in Pennsylvania. In those years, notable breweries such as Troegs, Victory, Yards, and Church Brew Works opened around the state. Since then, these breweries, along with nearly 150 others around the state have pushed craft brewing to new limits and produced some of the best beers in the country. During that same time, Weyerbacher Brewing Company opened in Easton, Pennsylvania. 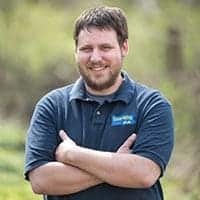 What started out as a small microbrew in 1995 has grown to be one of the most respected breweries in PA, and the largest brewery in the Lehigh Valley. Tours of Weyerbacher Brewery are great for any beer lovers that want to know more about how beer is made. 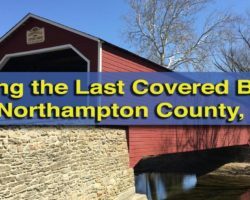 During this growth, the brewery also had to move out of their original building in downtown Easton and give up the brewpub that they operated from 1998-2001. However, the resulting brewery on the edges of town allowed Weyerbacher Brewing Company to grow considerably. 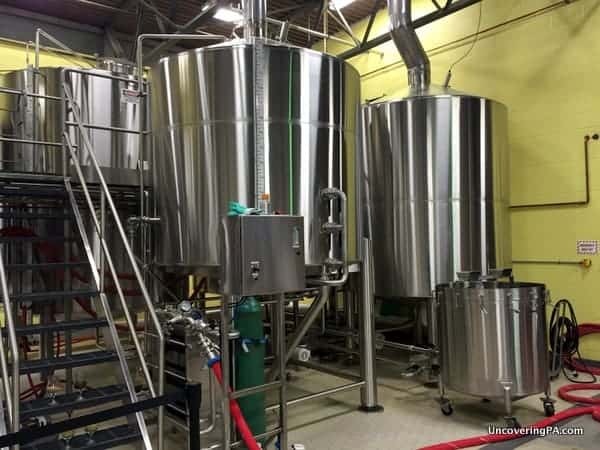 Today, the brewery is home to a small tasting room at the front of their large warehouse. It’s here that you can sample some of Weyerbacher’s year-round lineup and some of their more inventive brews. In fact, there are always several beers available that you can only get at the brewery’s tasting room. It’s also from the tasting room that tours of the brewery leave Fridays, Saturdays, and Sundays. 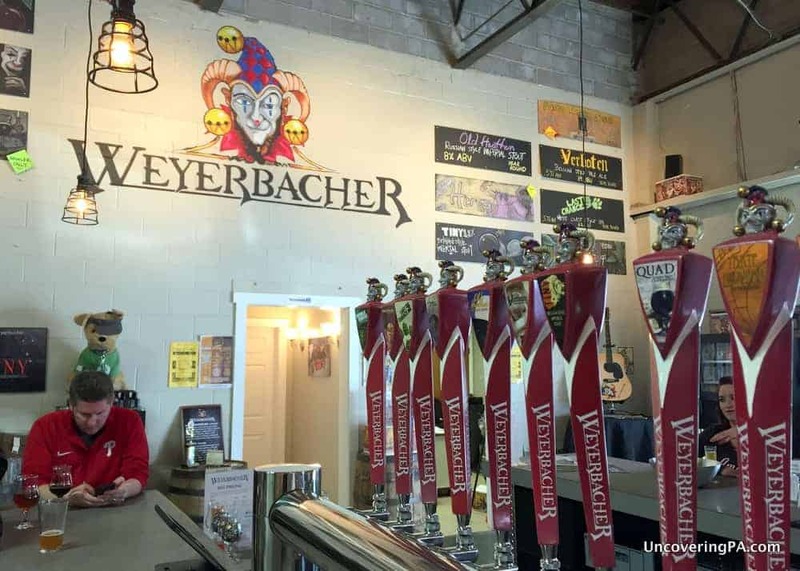 The Tasting Room at Weyerbacher Brewing Company features beers you can’t find anywhere else. 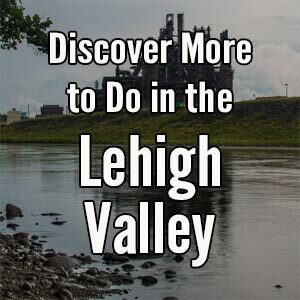 When I visited the Lehigh Valley in April 2015, I took the opportunity to take this free tour. Tours are quite informal and leave regularly throughout the day. 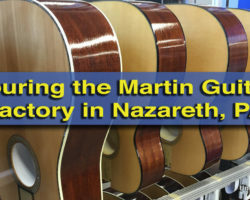 Patrons are encouraged to take beers with them on the tour. 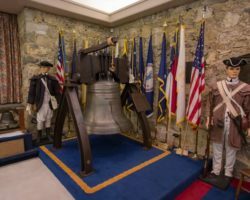 Unfortunately, unlike many other free brewery tours in Pennsylvania, no samples were offered for guests. Tours of Weyerbacher Brewery take 30-45 minutes depending on the guide and the number of questions asked. The tour takes visitors through all aspects of the brewing process, and explains a lot about the history of the company and how they make and package their beer. 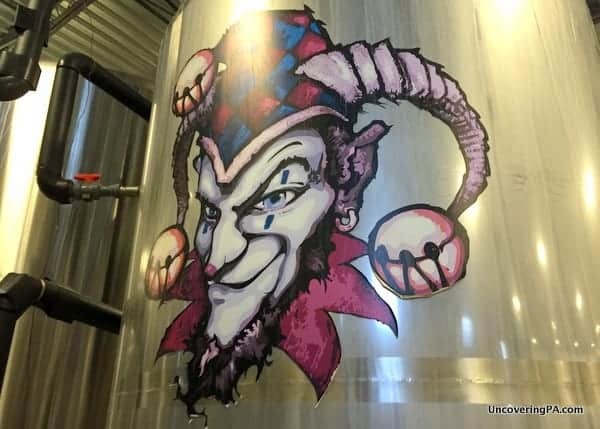 The process of creating beer at Weyerbacher isn’t significantly different than at most of the other breweries around the state, so the tour itself doesn’t offer much new if you’ve been on tours of other modern breweries. However, that’s not to say that the tour guide didn’t do a good job. Some of Weyerbacher’s brewing equipment seen on the free brewery tour. 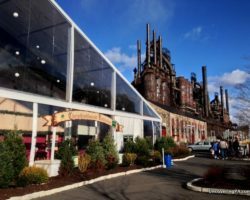 If you haven’t toured many breweries around the state and want to learn how beer is made, or you are a big fan of their beer, touring Weyerbacher Brewing Company in Easton is a great opportunity to learn more. 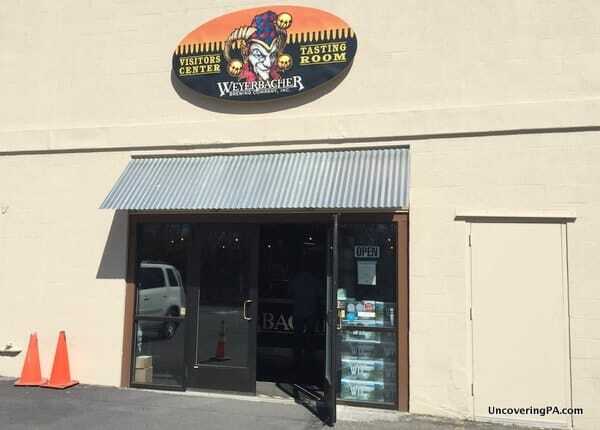 However, if you love beer, you should visit the Weyerbacher Tasting Room while in the Easton area. Weyerbacher Brewing Company is known for their big flavorful beers, so don’t expect any wimpy beers here. So, even if you’re a regular craft beer drinker, expect to have your taste buds tingled with something new at Weyerbacher. During my visit, I tried several of their beers, and really enjoyed all the beers that I tried. I honestly don’t know if I had ever tried Weyerbacher’s beer prior to my visit, but was glad that I found Merry Monks, their Belgian-style Tripel, and both of their outstanding IPAs. I also had the chance to try a few of their special brews and found them to be quite delicious as well. The visitors’ entrance at Weyerbacher Brewing Company. 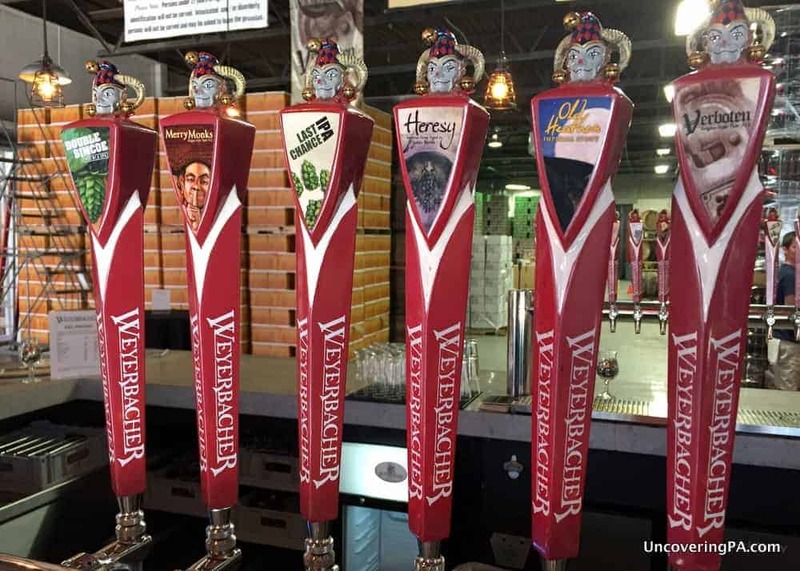 Weyerbacher Brewing Company is definitely a brewery for beer lovers, and a visit to the tasting room and a brewery tour should definitely be on the list for anyone that loves full-flavored beer. Weyerbacher Brewing Company is located on the outskirts of Easton, in the Lehigh Valley of Pennsylvania. Free brewery tours are offered Fridays at 5:30pm; Saturdays at 1pm, 3pm, and 5pm; and Sundays at 1:30pm and 3:30pm.